Home » Blogging Tips » 9 Ways You Can Make Your Blog Visually Irresistible To Your Audience! Here are the 9 ways you can make your blog visually irresistible to your audience. In the visual medium of internet, nothing sells more rapidly than glamour. By glamour, I mean everything that enhances visual experience of visitors and force them to return to your blog again. Similarly, when it comes to blogging, you need to build strong visual elements to attract your potential visitors. Have a look at blogs of successful bloggers in your niche industry. You will find one common element in most of them: visual appeal. So, if you are really thinking to give a boost to your blog, then you have to tweak the layout of your blog in a way that can make it look more aesthetically appealing to your audience. Just like stills, you will need videos to breathe life to your content. Videos are more engaging, and they attract maximum eyeballs than any other forms of content. You can find some really “exciting” and “engaging” videos on YouTube. However, if you are flexible with using a video camera, then you may create your own personal videos as well. Shoot videos related to your niche and post them on your blog. This will help you capture attention of your visitors and retain them on your website. Fonts are visual impeller that significantly affects your readership. You need to use your fonts strategically so that your visitors find it easier to scan the content. Make your headings clean and bold while keep the body text plain. Choose no more than two different fonts style. Colors have an impact on mood of visitors and therefore affect your visitors in big way. By using a mix color plate, you can dramatically make your blog appealing to your visitors. However, you need to be a little discreet with your use of colors and use them tactically. Keep a single color for general text and use special colors for important links, heading or other important parts of your text. Work up your text to make it readable and attractive to your readership. Luckily, you have various ways to make your text scannable and easy to read for your audience. Use headings and sub-headings wherever required and write important points in bullets. Make your text italics, bold and underline to highlight important information. White space is an area of your blog without any content. Professional bloggers use white spaces to give a clean and neat look to a blog. Make sure that you use enough white spaces in your blog so that visitors can easily scan its different sections easily. To retain visitors on your blog, you need to break your information and make it skimable. Use short sentences and paragraphs. Tag your paragraphs with relevant headings and sub-headings. Use bullets, lists and numbers to lay out important data. People attract more to visual stimuli than anything else in a blog. Therefore, an appealing design can make all the difference in visual layout of your blog. 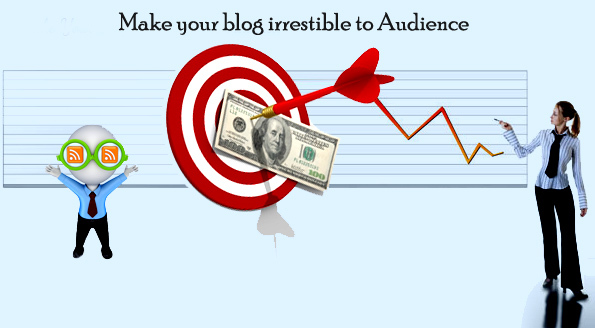 But, if your blog lacks high-quality graphic elements to attract audience, you will lose your visitors sooner or later. However, if graphic design is not your thing, you can even get a professional help. Hire a professional graphic designer who can create an appealing design of your website according to your target audience. Make sure that your contents are uniform in every part of your blog. When a visitor views a 400px image in your post followed by a 700px, he loses the balance and bounces to another post. In a nutshell, your blog cannot hold visitors for longer time without a homogeneous style. Therefore, it is important that your blog looks consistent in every aspect. Helen Dina is an educational expert at Essay Boutique, an academic consultancy agency in UK. She also contributes to different educational blogs and websites. Don’t forget to share this post on Social Networks and Join my newsletter to get updates in your inbox. Thanx a lot friend. Nice and informative stuffs. Thanks for reading my blog and your energetic appreciation. Keep on coming here. I think with the amount of competition nowadays with hundreds of blogs opening daily, it’s essential that you learn to stand out from the others and for that you need to attract your readers, which only happens when your blog is visually irresistible and of course, no compromising on the content too! If you use attractive images, and your lines are well spaced out, or perhaps you add videos and break the usual monotony of a blog post filled with only text, your blog will attract people. I usually add colored boxes for tips alongside, so a little color here and there also adds up. Thanks for stopping by mam. Glad you like this post. It’s like survival of the fittest. Nowadays there are lot of bloggers and newbie bloggers are emerging. To survive in the blogosphere, we have to see all the things like appearance of blog, comments on the blog, page rank, alexa rank, domain authority etc. As a blogger, who interested in sharing their idea, he don’t bother about such things, unique content is enough. Just having “Unique Content” we can’t attract others. We need attractive themes, colorful subscription box, clear cut fonts etc. An attractive tiffin box with ruined food is not acceptable. Hope to see you again mam. Visual appearance of blog is very important to a blogger. A pure or professional bloggers know about the content and ranking of blog, but others didn’t know, whether the content is good enough. Majority of traffic, we can get from non bloggers. So we have to improve our theme to view our blog. Glad you like this post. Thanks for your appreciation. Keep on reading my blog. Wanted to stop by and check out your blog. Saw this post that Helen wrote and I do agree that our blogs have to be visually appealing. I was speaking with my mastermind partner this morning and we were talking about a few blogs that we visit every once in awhile. I seriously don’t know what they’re thinking but their layout is horrible. I only stop by every once in a while because I like them and want to support them but their layout and theme honestly give me a headache. For the most part I only use one image at the beginning of the post unless I’m sharing specifics with screen shot photos. If I include a video it will usually be halfway down. I do break up the paragraphs a lot and make them short so that if I have a lot of skimmers they’ll be happy to be able to get through my content okay. For the most part it’s the content that we need to worry about keeping readers coming back but if your blog is really bad and not appealing at all it will be hard for them to keep returning. Great points, thanks and hope you both have a wonderful week. First i wanna welcome you. Because this is your first visit to my blog. And then thanks for making a comment here. Here i have to agree with your points. I appreciate you for the support you giving for the bloggers. Because of the layout and worst theme you have got headache. It’s the major problem of some blogger’s having good content and bad visual. They are thinking that, by displaying more number of ads, they can earn more money. More ads = Less Page Views. It will be irritate for the readers to read your blog. Anyway, glad you liked my blog’s visual appearance and my content. Keep on reading my blog. Have a nice day and wonderful week. I can’t find anything to disagree with here. I would say that if one could do everything else except figuring out the design, which means knowing you can write, that you do all that stuff and worry about design later on. Most people will love your writing long after they’ve started to ignore your design. Good stuff! Thanks for making a comment on my blog. Thanks for stopping by. Keep on coming. Have a nice day. Great work! That is the type of info that are meant to be shared around the net. Hope you will continue writing best quality articles in future also.